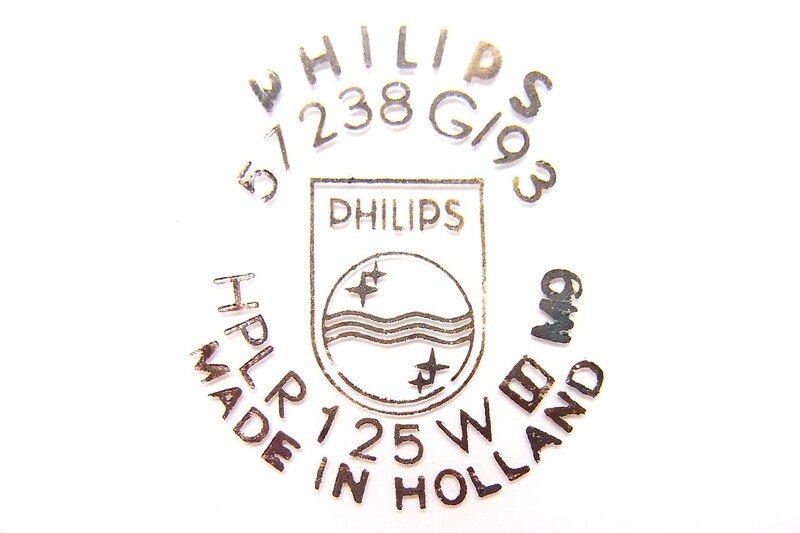 This lamp is representative of one of the last Philips mercury reflector lamps made with the company's Magnesium Fluoro-Arsenate phosphor before changing to the more efficient Yttrium Phosphate-Vanadate chemistry during latter part of the 1960s. Unusually for such a low wattage rating, it employs an E40 cap, which was only produced upon special request. The original 125W mercury fluorescent lamps of the 1930s employed E40 caps and it was not until the 1950s with the development of Magnesium Fluoro-Germanate phosphors, which permitted a significant reduction in bulb size, that the smaller E27 cap became standard for the 125W rating. Mercury lamps were not manufactured in reflector bulbs prior to that time, so it is surprising that such a late model as this should have been offered with the large E40 cap. Possibly the reflector bulb was offered as an upgrade for older E40 luminaires originally made for non-reflector lamps. 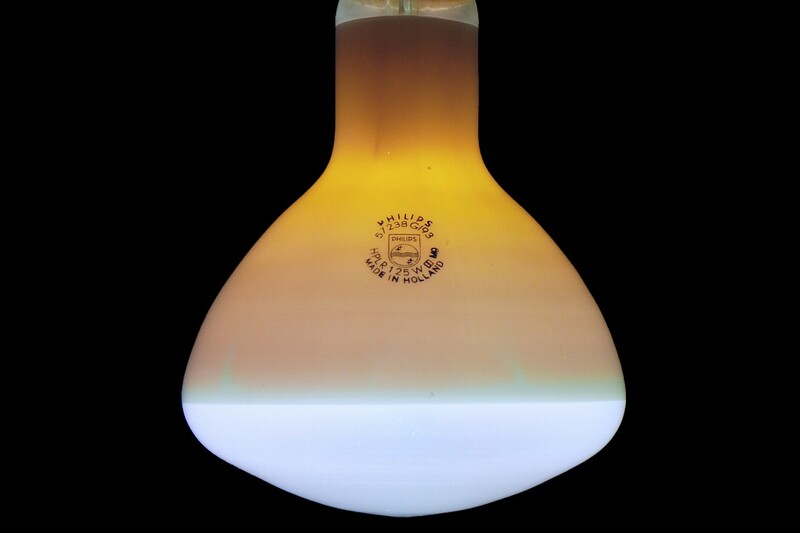 The bulb is blown in borosilicate glass, and is acid-etched on its internal surface. 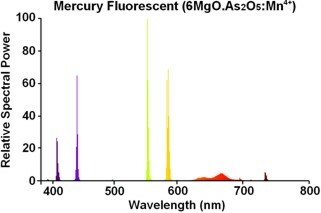 This homogenises the light colour throughout the beam, since the arc tube radiates the classic blueish-green light while the phosphor coating around it adds the red component. 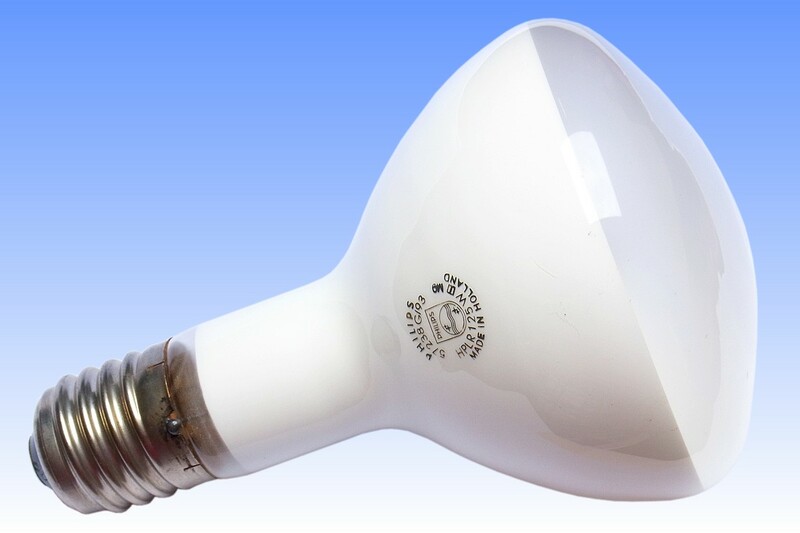 The bulb is double-coated, first with a partially translucent layer of white titanium dioxide powder which acts as a diffuse reflective coating, and then overcoated with the vanadate fluorescent powder. The coating thicknesses are adjusted so as to allows a small amount of light to escape through the coating, but the vast majority is reflected downwards. Due to the uncoated bulb crown, the red ratio is slightly lower than non-reflector types having the same phosphor coating. References: 1) Philips Lichtcatalogus "Gasontladingslampen" c. 1975. 2) Philips Training Manual MTO Turnhoutlampen, Hogedruk-Kwiklampen, Van der Stap & Goethals, 1986.